General Contractor: C&S General Contractors Inc. 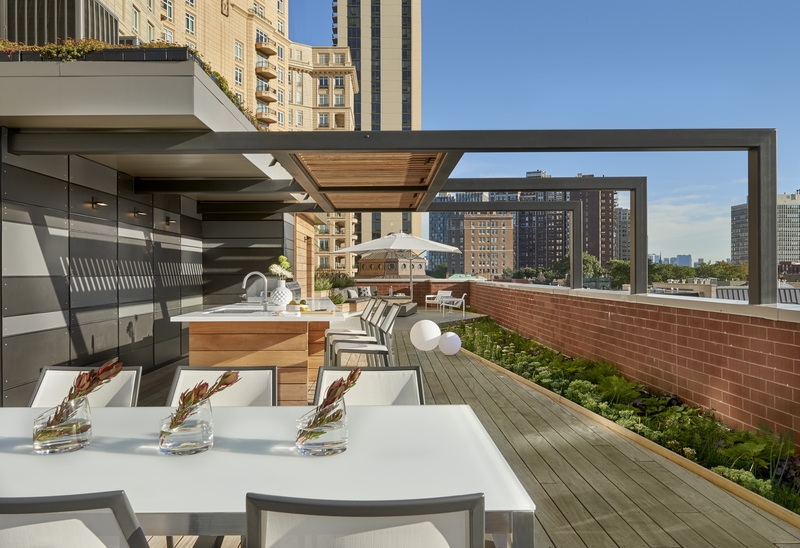 This rooftop retreat, perched atop a residential building overlooking Lincoln Park, was designed for a young couple and their family. The penthouse home below is combination of two condominium units, allowing for a 3,400 sf space that covers the footprint of the building. 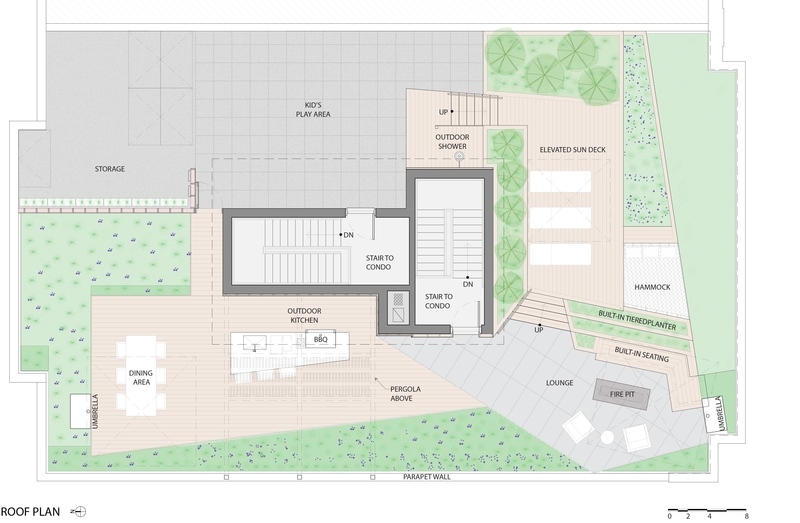 Program requirements included a full kitchen with grill, dining area, lounge seating, sun deck, outdoor shower, and a large play area with a cushioned sport court for children. 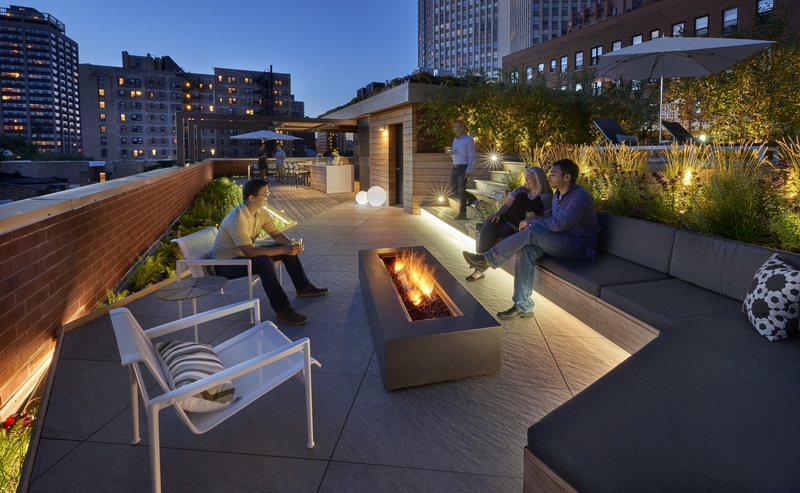 The expansive space creates a feeling of a rooftop yard. There are multiple levels of wood decking and large-format porcelain pavers connected by terraced steps. Built-in planters contain drought tolerant ornamental grasses, Allium Summer Beauty, mint, and Wild Oregano. The decking, setback from the parapet wall for privacy and safety, overlooks a green roof that creates a border of flowering sedum around the property. A “forest” of Heritage River Birch trees is located adjacent to a neighboring property for privacy, and a green wall of Dappled Willows creates a lush backdrop for the sundeck. The dining deck appears to float in a lake of green sedum, and the lounge is oriented for sunset views and has a fire table. A playful and unique element is an over-size hammock bed integrated into the decking, suspended over the green roof, creating a relaxing space for a summer nap or afternoon reading. One challenge was incorporating existing building elements into the landscape: The sundeck rests atop the elevator shaft, providing views of Lake Michigan and protecting the built-in lounge seating below, and the kitchen is shaded by a steel pergola with cedar louvers which extends from an existing overhang. 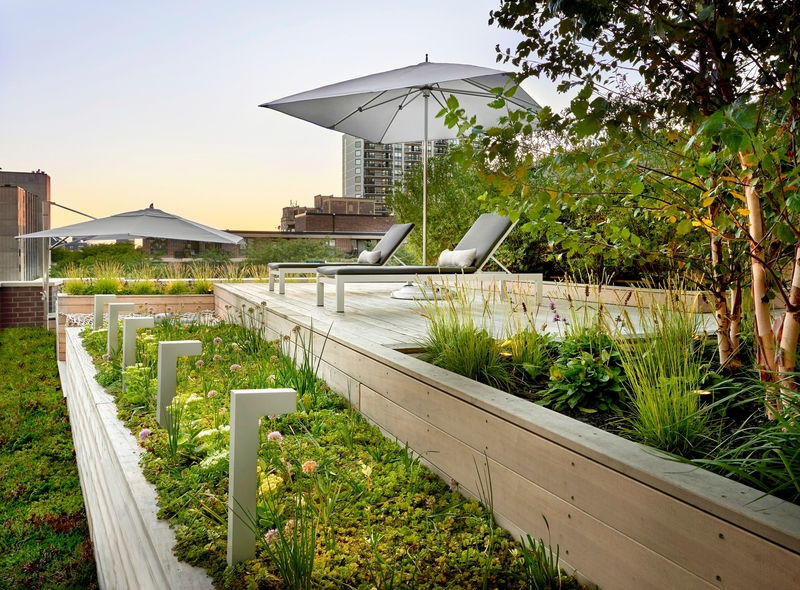 Sustainable elements include drought-tolerant plantings, including a rain-water absorbing green roof by LiveRoof, sustainably harvested FSC Garapa and Ipe decking, and energy-efficient LED lighting.